When IFR Probabilities are enhanced over high terrain, how confident can you be that IFR conditions are occurring? Surface observations are rare on mountain tops. It’s possible that clouds occurring are at one level as the terrain rises up into the clouds, and ceilings at adjacent stations can give an indication of the cloud base (in the present case, ceilings are about 9000 feet above sea level at Seattle, for example). Suomi/NPP Day/Night band imagery can verify that clouds exist in the region where IFR Probabilities are elevated. The toggle below, of Day/Night band and Brightness Temperature Differences, shows compelling evidence (even in low light conditions) of clouds along the spine of the mountains in central Washington and Oregon. High-resolution MODIS data are also used to produce IFR Probabilities, and they can be used to deduce the presence of low ceilings/reduced visibilities as well. The toggle below, from 1027 UTC, shows the brightness temperature difference field (11.0 – 3.9) from MODIS and the IFR Probability field. It is likely in this case that high clouds were shrouding the higher peaks of the Cascade Mountains. This entry was posted in Day/Night Band, MODIS, Pacific Northwest, Suomi/NPP, Terrain on May 28, 2014 by Scott Lindstrom. The toggle above highlights a strength of the GOES-R IFR Probability fields compared to the GOES Brightness Temperature Difference when it comes to detecting low fog/stratus. The Brightness Temperature Difference field only sees the top of the cloud. In the toggle above, the region of elevated stratus, the stratus over western Virginia and western West Virginia is highlighted, but those clouds are unimportant for aviation/transportation, and IFR Probability fields ignore that region (save for the spine of the Appalachians where the mountains are rising up into the clouds, so ceilings are near the surface). There are heightened IFR Probabilities in/around KEKQ (Monticello, Kentucky) at 0630 UTC: what is the character of that fog? It’s difficult to tell with the coarse GOES resolution (although someone familiar with the topography of eastern Kentucky might guess). The imagery below toggle between the high-resolution (1-km) Suomi/NPP VIIRS Brightness Temperature Difference (11µm – 3.74µm) and the Day/Night Band at 0638 UTC. The higher resolution imagery allows the dendritic nature of the valley fog to appear in a way that is impossible with the coarser-resolution GOES data. Fog is initially developing in river valleys. Both the Brightness Temperature Difference and Day/Night imagery, however, are seeing only the top of the cloud and are not giving information about the likelihood of fog. But the cloud structure would alert a forecaster to the probability of developing fog (as does the time trend in the GOES-R IFR Probability fields). Note how the cirrus shield east of the Appalachians shows up distinctly in both GOES and VIIRS brightness temperature difference fields. High clouds such as those prevent the satellite detection of fog/stratus at low levels. In those cases, only the IFR Probability field has a chance to detect fog if it is present. 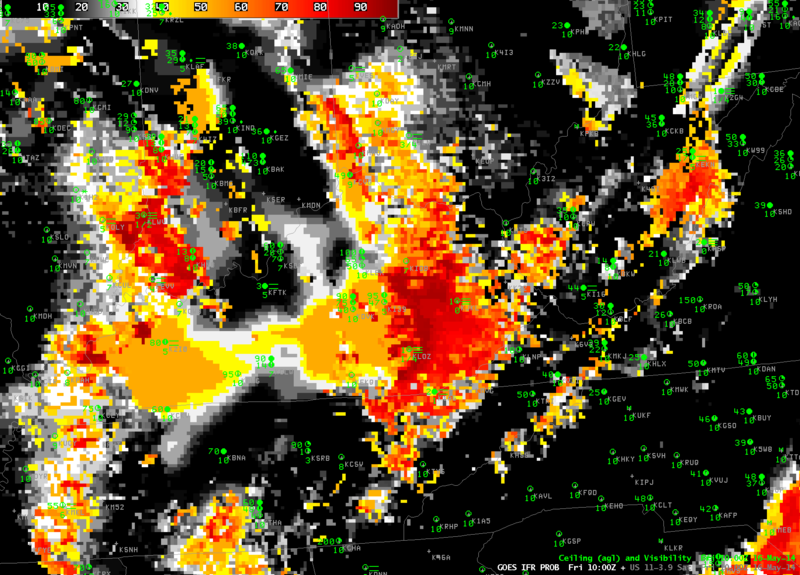 By 1000 UTC, the fog that was initially confined to river valleys over central Kentucky has expanded. In this case, Suomi/NPP data (or the trending of the GOES data) gives a forecaster a heads up on the development of overnight fog. This entry was posted in Appalachia, Day/Night Band, Suomi/NPP on May 16, 2014 by Scott Lindstrom. Clear skies allowed for radiation fog with IFR conditions to develop over eastern North Carolina overnight. GOES-R Cloud Thickness as observed at the last time before twilight conditions begin — in this case at 1000 UTC (6 AM EDT) — can be used as a predictor for fog dissipation time using this chart. At 1000 UTC, maximum cloud thickness was 1000 feet, which suggests a dissipation time around 1300-1330 UTC. The visible animation, below, is in agreement with the prediction from the cloud thickness field. A toggle of two images with Day/Night band imagery, below, shows the difficulty in using the Day/Night band to identify regions of fog/low clouds consistently. In the 0615 UTC image, the developing low clouds show up well (Of course, it’s hard to tell if the clouds are low stratus or mid-level stratus), but the picture at 0745 UTC is a lot less distinct. This entry was posted in Cloud Thickness, Day/Night Band, Mid-Atlantic on May 12, 2014 by Scott Lindstrom. Clear skies and light winds over the Florida Panhandle allowed radiation fog to develop, and the GOES-R IFR Probability field ably captured the region of IFR conditions, as shown above. Note how the GOES-R Fields provide information that looks less ‘noisy’: the heritage products — Brightness Temperature Difference and Cloud Thickness — both have signals over interior Alabama and Mississippi where IFR conditions were not reported. In addition, the well-known co-registration error in the 10.7 and 3.9 sensors produces a faulty signal along the Florida coast east of Appalachee Bay. Eventually this signal because so strong that it bleeds into the GOES-R IFR probability. Cloud thickness can be used to forecast fog dissipation time, using this chart and tempered by experience. The last pre-sunrise cloud thickness is shown at 1045 UTC in the loop above, and is around 1000 feet, suggesting a dissipation time around 1345 UTC. The visible animation below corroborates this estimate. This entry was posted in Cloud Thickness, Deep South on May 6, 2014 by Scott Lindstrom.